If you have a business that offers goods/services outside the UK to Europe then this article will explain how the VAT is treated in Pandle. When selling goods or services from the UK to other EU countries, the VAT treatment can differ depending on your customer. As a general rule, when selling to non-VAT registered businesses and consumers in other EU countries you should charge them full UK VAT on your sales ('ST' VAT code in Pandle). However, you do need to check each countries' 'distance selling threshold' to see whether you need to register there as well (see below). If you are selling to another EU business that is VAT registered in their country, then you can zero-rate the sale. This means that you charge VAT but at zero percent. To do this you should ask your customer for their VAT registration number and show it on your invoice with a note to say that you are zero-rating the sale. ES: Europe Services, if you are selling a service to your European customers. EG: Europe Goods, if you are selling goods to your European customers. You must also complete an EC Sales list which is a quarterly report to HMRC listing the sales to your VAT registered European business customers. 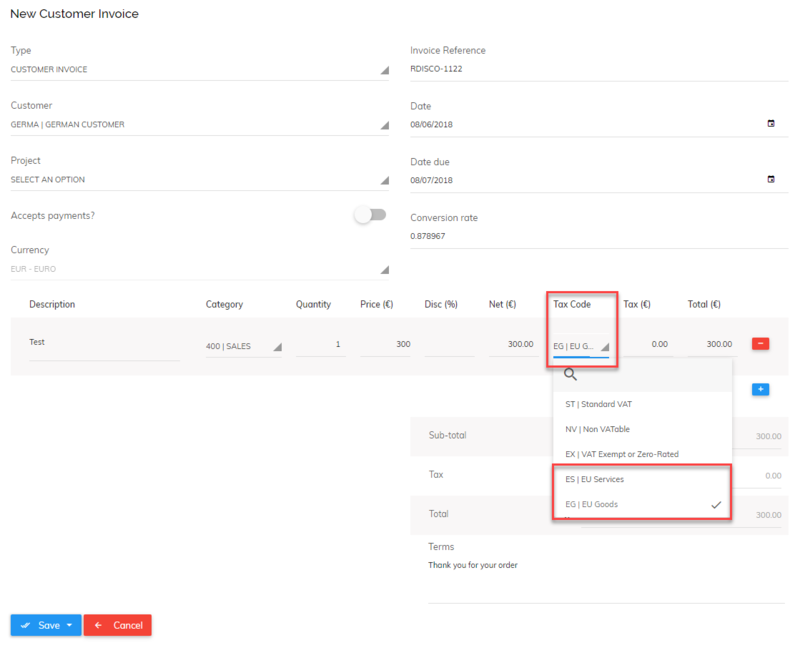 If you use the correct VAT codes in Pandle then the software will populate your EC Sales list automatically each quarter (always the calendar quarters). As you can see, the EC sales list in Pandle has picked up the invoice just raised to your German customer. 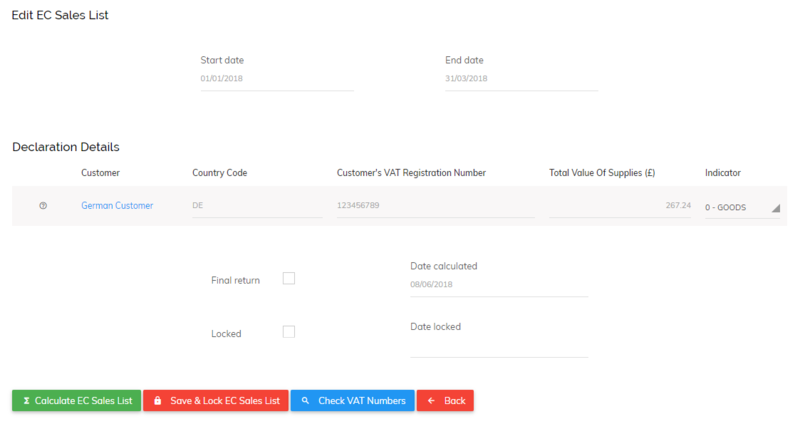 There is a button here to 'Check VAT Numbers' which will ensure your customer's VAT numbers are legitimate, and therefore whether or not you can zero rate the VAT. Once this is checked you can lock the return and submit it to HMRC. Should you register for VAT in other EU countries? Distance selling is when a VAT-registered business in one EU country sells goods or services to a non-VAT registered customer in another EU country. Each country in Europe has a distance selling VAT threshold, which if breached means that you must register for VAT in that country. However, this only applies to the sales you make to customers that are not VAT registered in their own country. So for example, the distance selling VAT threshold for Germany is 100,000 euros and Ireland is 35,000 euros. So if you sell goods of 50,000 euros to non-VAT registered consumers in each country you would need to register for VAT in Ireland but not Germany. This means you should keep an eye on the level of sales you’re making to consumers in each European country so that you know when you breach these registration thresholds. You do not need to charge VAT on goods or services you sell to customers outside of the EU. However, goods are treated slightly differently from services. Goods are zero rated, which means the value of the goods will show on your VAT return (use VAT code 'EX' in Pandle), albeit with no VAT reported. But services sold outside the EU are what’s called ‘outside the scope’ of VAT (use VAT code 'NV' in Pandle). This means that they are not reported on the VAT return and VAT is not a consideration. Different types of businesses can have different rules. For example, if you sell digital services such as e-books, downloads or apps then there are new rules which may mean you need to register for VAT even if you do not breach the thresholds. These are general rules and this area can get a lot more complex, so it’s always worth discussing VAT with a professional.